Manhattan Beach opens in Brooklyn during the Great Depression. Anna Kerrigan, nearly twelve years old, accompanies her father to the house of a man who, she gleans, is crucial to the survival of her father and her family. Anna observes the uniformed servants, the lavishing of toys on the children, and some secret pact between her father and Dexter Styles. 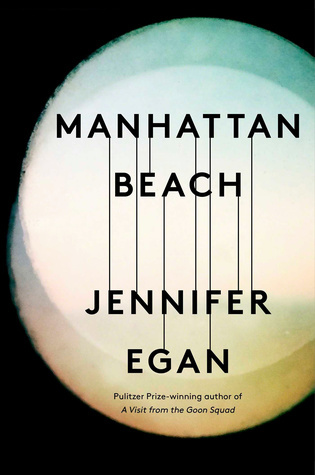 Years later, her f Manhattan Beach opens in Brooklyn during the Great Depression. Anna Kerrigan, nearly twelve years old, accompanies her father to the house of a man who, she gleans, is crucial to the survival of her father and her family. Anna observes the uniformed servants, the lavishing of toys on the children, and some secret pact between her father and Dexter Styles. Years later, her father has disappeared and the country is at war. Anna works at the Brooklyn Navy Yard, where women are allowed to hold jobs that had always belonged to men. She becomes the first female diver, the most dangerous and exclusive of occupations, repairing the ships that will help America win the war. She is the sole provider for her mother, a farm girl who had a brief and glamorous career as a Ziegfield folly, and her lovely, severely disabled sister. At a night club, she chances to meet Styles, the man she visited with her father before he vanished, and she begins to understand the complexity of her father’s life. Paromjit Christiane wrote: "This is a sensitive and intelligent review, which helped me channelling my thoughts. Not yet finished ... I am fascinated about Ann Christiane wrote: "This is a sensitive and intelligent review, which helped me channelling my thoughts. Not yet finished ... I am fascinated about Anna‘s development and also how many different stories Manhattan Beac..."
Paromjit leslie hamod wrote: "Wonderful my dear Paromjit! You have entranced me!"